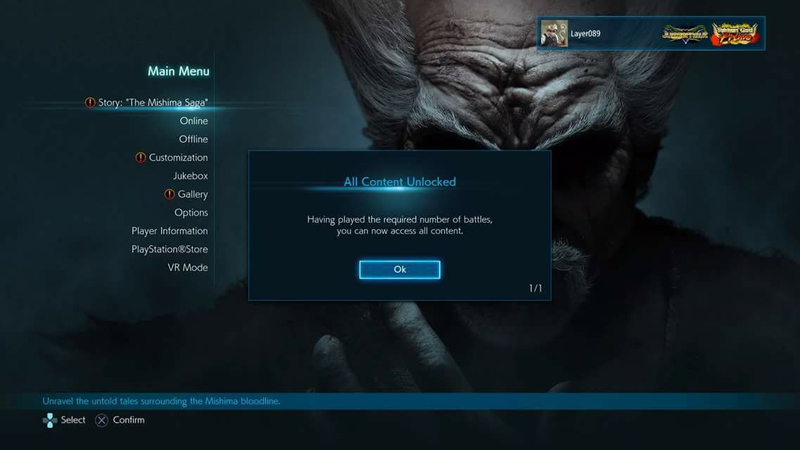 Learn how one gamer unlocked all of Tekken 7’s content and how you can too. Tekken 7 has only been out a little over a week and people have already gotten in a lot of games. No, we mean a lot. And if you play enough, you’ll get a message saying that you’ve unlocked all content in the game – including all gallery items, customization items, and anything else the game has to offer. A Tekken gamer named Larry Davidson has done it already. Take a look. I swapped the RK button to LK and picked Katarina. I turned turbo on for the 3 (X) button so it would skip through the next fights. I let Katarina 444444 her life away while I slept. It took 3 nights. I did nothing. The consensus is that all you have to do is play a combination of 2,000 games in any mode – win or lose. It doesn’t matter if it’s offline or online either. Just play the game, and a lot and you’ll see a message like the one above. How long do you think it will take you to play 2,000 games?